When I was a kid Tamiya R/C cars were all the rage; The Hornet, The Frog, The Grasshopper and the top of the line 4WD Hotshot. My memory is that only rich kids had them. The one I craved most was The Hornet. 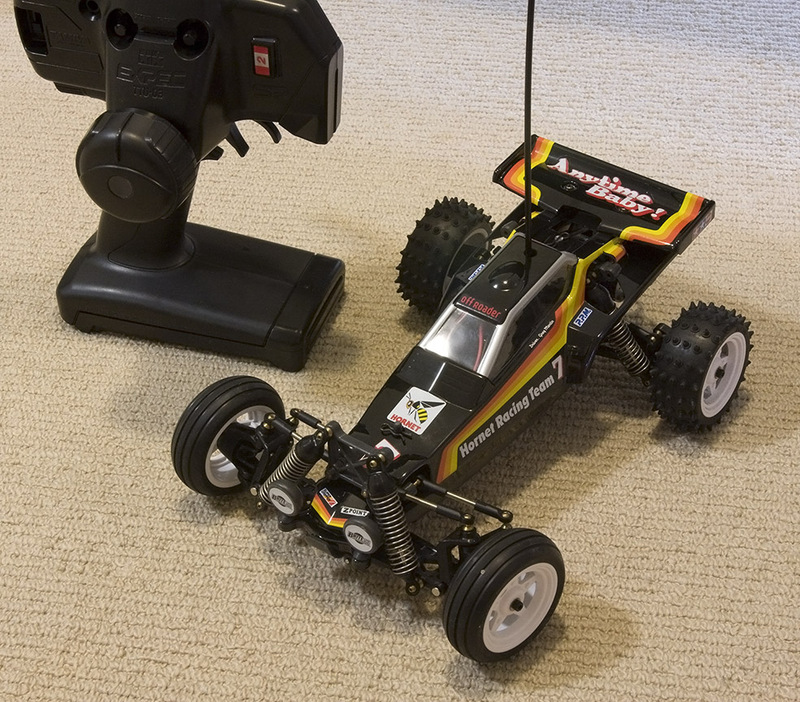 Well recently I discovered that Tamiya have released a range of smaller scale retro “expert built” cars. Awesome! Completely assembled, all the parts you need included. Just charge the batteries and away you go! Someone has done an excellent review of The Frog, which is mechanically identical to The Hornet. Hobbyco in the QVB was sold out so I went searching. I found an ebay seller in the states that was selling The Hornet; cheaper too, even with FedEx shipping. The box arrived this morning. I opened the box, stuck the battery pack on the charger and headed off to work. Mucking around with the car this evening, I’ve found that our apartment block’s underground parking area is perfect for racing. The pillars make a great obstacle course. Now that is frekin awesome!